To the reader - Well, not really. But then again, it all depends on what you mean by "money to be made". It's relative. That's what a reader wants to know in the "Ask A Cab Driver" section of this website, the reader's comment dated April 22, 2011. The question is, "Is there money to be made as a taxi driver?" My answer - If you mean a six figure income, the answer typically is no. But can a taxi driver earn as much as $65,000 a year in gross income even without a medallion? Sure. Of course. But it isn't considered the norm. A night driver once told me he earns about $65,000 a year, and that's without a medallion. And I believe him. Why not? But he said he drives Wednesday, Thursday, Friday, Saturday, and Sunday nights on an assigned cab. That's considered one of the best shifts because the Thursday, Friday, and Saturday nights are the busiest nights. And he has an assigned cab so he drives the same cab every night, and sometimes that can help make driving cab easier. But most non-medallion taxi drivers would say that they're not making that much. “Nearly all observers of the industry agree that taxicab drivers, especially non-medallion holders, have a low standard of living. While income estimates vary widely, it is reasonable to assume that the average full time non-medallion holder earns approximately $24,000 per year. With an additional $22,000 in leasing income, a medallion holder earns $46,000. I think this study lowballs the estimate, but remains not too far from the gist of it. But taxi driver income is highly anecdotal. Even with electronic tracking systems that the City is currently implementing in all of the taxis' GPS systems, there will most likely be a high percentage of error when trying to analyze data, with respects to drivers' earned incomes. That's because even though tracking systems will record exactly how many times meters were turned on and off, for how long, where, and when, still - taxi drivers turn meters on and off all the time for various different reasons, not just because they have fares. And so the readings will not necessarily indicate how much the drivers actually took in. Someone else posted in the "Ask A Cab Driver" section dated April 25. The writer makes a notable point, "..in my opinion taxi cab driving is a hustle. just like any hustle if you can't cut it and survive then you need to find a new hustle." Now, I typically wouldn't tell someone to go get a new hustle if they can't make it in the cab business... even if they should go get one. I'd leave that up to that individual to figure out for himself or herself. But the commenter makes an important point... some drivers know how to make more money than others. In my opinion, it takes more savoy than skill to be a good cab driver. That's because in my opinion, taxi driving is not a skilled profession because it's easy to steer a steering wheel and step on brakes and gas pedals. But it does take a good deal of savoy to know where and how to find the fares. And it takes some stamina too. I also agree with the second commenter that it makes a lot of difference to like what you do. 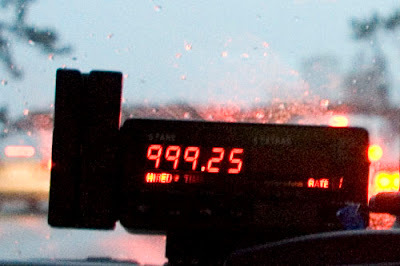 Taxi Drivers' incomes vary drastically. For example, one medallion holder told me he averages above $400 regularly on Friday nights, and said that one Friday he easily cleared $500 in take home pay for the night. I have no reason not to believe him. His income is far better than my Monday morning take home pay, and by industry standards, I do pretty good on Mondays. But why shouldn't I believe him? Another driver that drives Friday nights told me that anyone who claims to be taking home more than $200 on a Friday night is lying. Really? Still, a day driver once told me on the bus ride home that he earned a combined total of $10.00 take home pay after working two full-time shifts - a Saturday, and then the following Sunday. He had very little good things to say that day. And I had to listen to him pout the whole way on the bus. But I didn't tell him to go find another hustle. I didn't say much at all until I got to my stop. And then I said, "Have a nice day."